Equipment for period: from 1940's to 1950's. The Marconi Mk II TV camera appeared first in 1951. 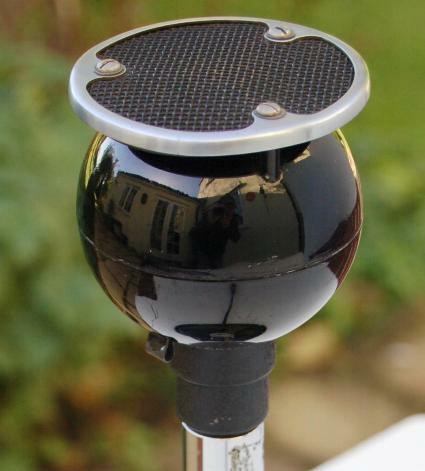 A 3"inch Image Orthicon, this camera type was used mainly on outside broadcasts by the BBC until the early 1960s. Notably, this camera type covered the 1953 Coronation broadcast. 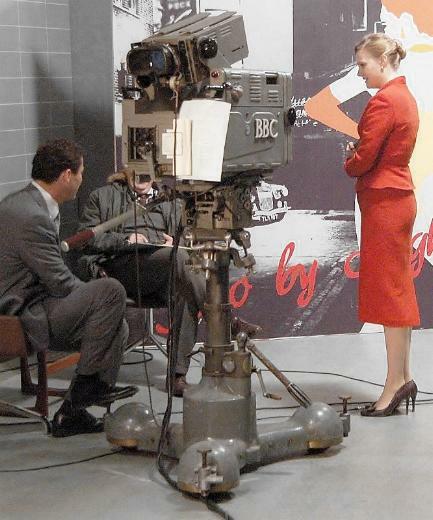 Also, the camera was used by Associated-Rediffusion in their London studios & CBC TV in Canada. The larger picture shows the camera 'dressed' for a recent production. 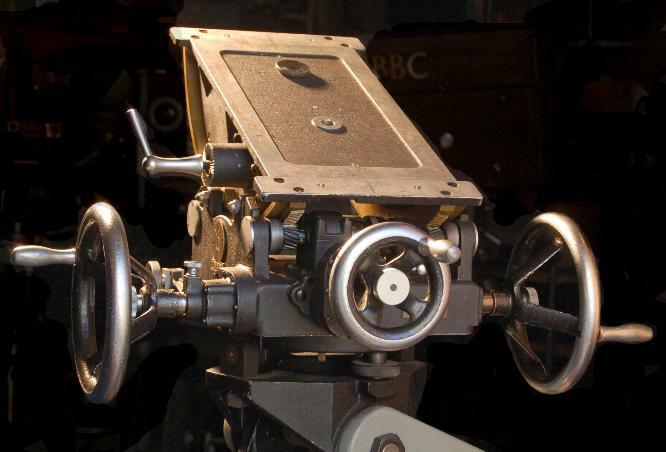 The Newman Sinclair 'mute' model G 35mm movie camera had a clockwork drive and used a pre-loaded film cassette. The camera was used by newsreel companies during the Second World War (the evacuation of Dunkirk etc) and the Korean War. 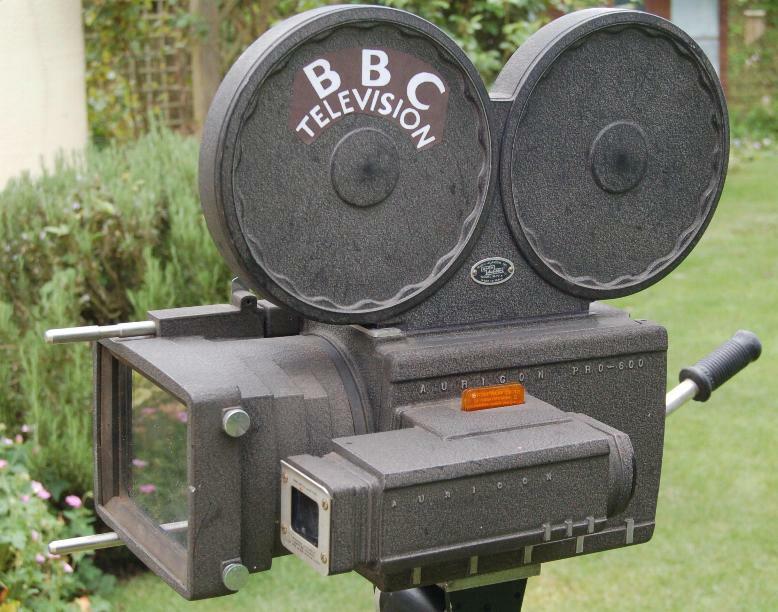 Television used the camera to shoot programme inserts, documentaries and early tv news footage. The camera pictured is in untested working condition and could be used to shoot footage. 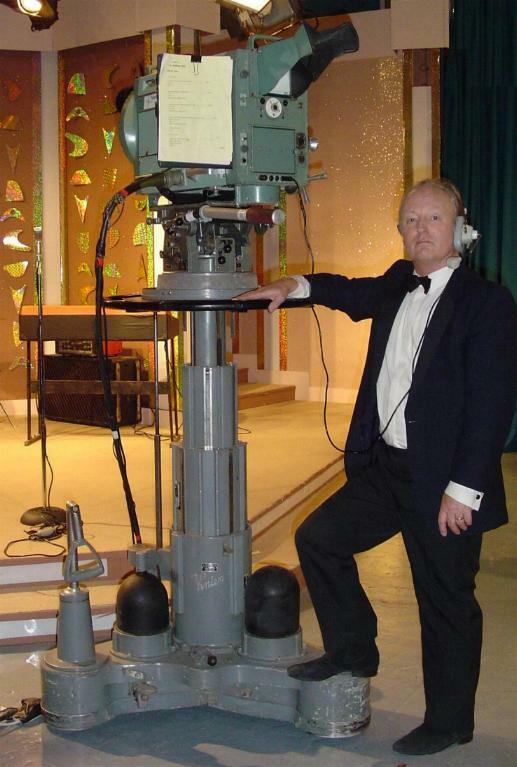 The EMI 203 was a 4 1/2" image orthicon camera used in the UK by BBC Television and ITV. European broadcasters included RAI(Italy)and MTV(Hungary). 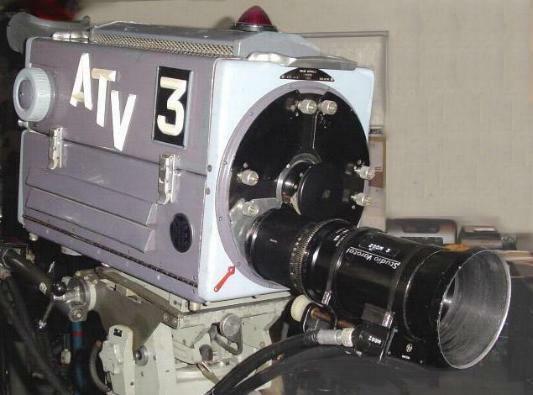 The camera had a four-lens mechanical turret with a blanking plate which could be removed. This enabled the camera image tube to be inserted. A special plate could hold also a fifth lens or diascope. Larger picture shows camera rear with functioning viewfinder and cue light. The WALL 35mm camera was a 'single system' optical sound camera. 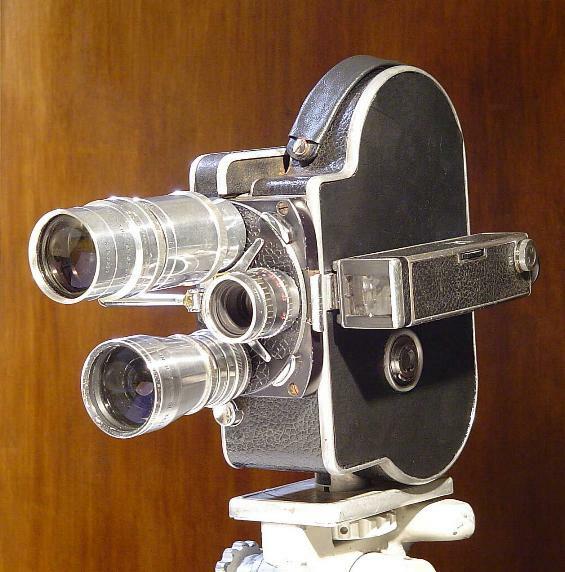 Robust with four lenses, this camera was designed for mainly newsreel work (Movietone News etc). The camera first appeared in the mid-1920s and a sound version, in 1935. The camera continued in use until the late 1970s. Larger picture shows our Wall dressed for a 'news scene' with our Bell & Howell 2709, a Newman Sinclair plus period microphones and stands. CINTEL monochrome monitors had distinctive red control knobs. Housed in restored vented gold cases, GA-TV has two examples with 17" inch screens. 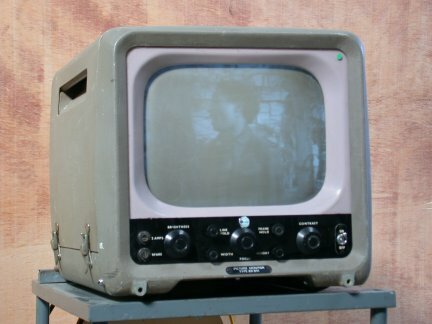 Used originally in 1959 by Anglia Television at their Norwich studios, one of our monitors has an implanted modern CRT, enabling a high quality video image from an external source to be displayed. 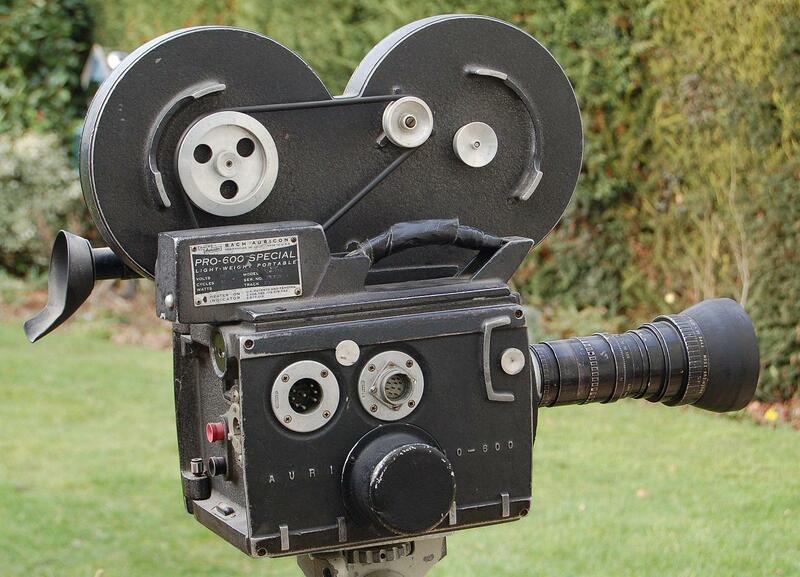 High quality 16mm silent movie camera used by tv news, wildlife photographers and the well-heeled amateur. Through the lens reflex viewfinder. Three-lens turret or zoom. The Bell & Howell 70DL was a high quality, lightweight but very rugged 16mm clockwork silent camera with a three lens turret and corresponding lensed viewfinder. The camera used 100ft of spool-loaded film. With the facility of through-the-lens critical focussing, this camera was an ideal choice for tv news, wildlife, and documentary film makers. The larger picture shows the correct hand-held 'shooting' position and also gives an idea of camera size. 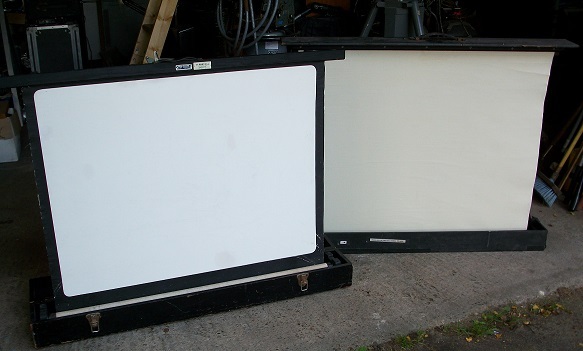 Mole-Richardson 2K fresnel spot with barn doors, used extensively in theatre, film and tv studios. Very heavy item. The ECLAIR 'Crab' originated in French film studios, pre-war. Purely mechanical with steerable linked tri-wheels, this pedestal could be elevated in two stages to a height of 6ft. Used from the early 1950s in tv studios and particularly on obs. Still used. Still in use somewhere, the innovative Vinten Mk 3 Pan & Tilt head used risers and cams only (no fluids) to maintain the centre of gravity. This made the tilting of heavy cameras relatively easy. Indeed, if correctly mounted, a camera could be left at any tilt angle without lock off. 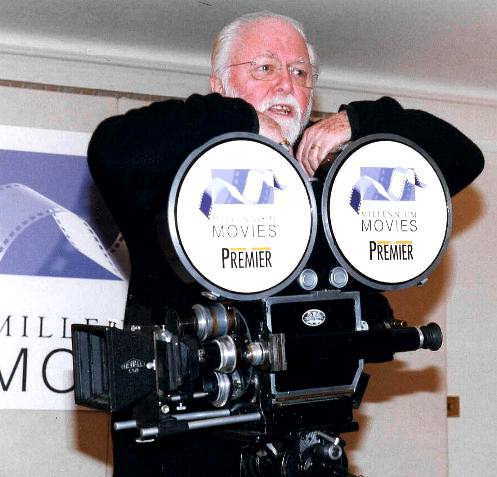 Our picture shows designer Bill Vinten inspecting an example of his invention. 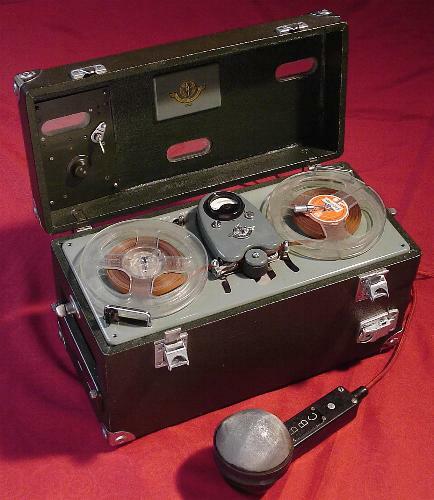 EMI produced in the early 1950s a battery operated portable tape recorder referred to as the 'Reporter'. This machine had three record speeds. The original models had valves. 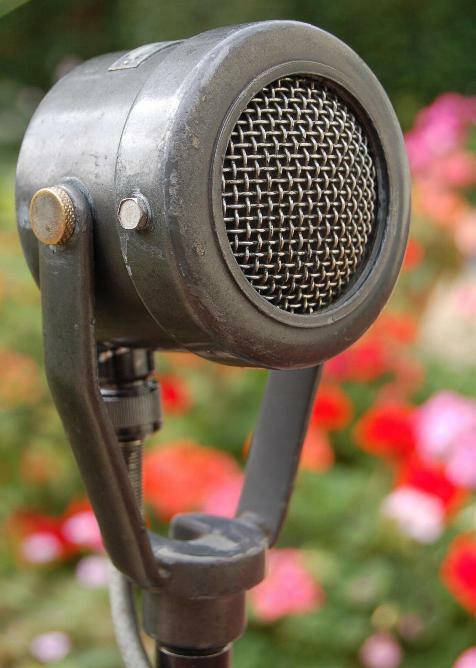 Much used by BBC documentary makers and news, the picture shows also an STC 4032G moving coil hand mic (ca:1955). Recorder non operating. Battery/mains VHF 405 line portable television with VHF radio. Watch me while I flatten your car battery! Circa 1956. 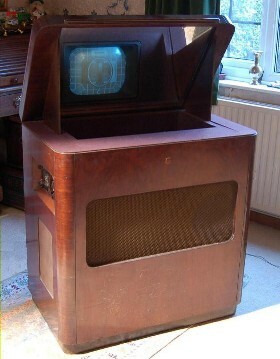 BBC Television used a considerable number of these sets as monitors, usually on obs. 16 mm 'Stylist' film projector in good working order. Classic 'whirr' from the mechanism and an interesting design. Heavy duty 16mm sound projector. Military/industrial applications and use. 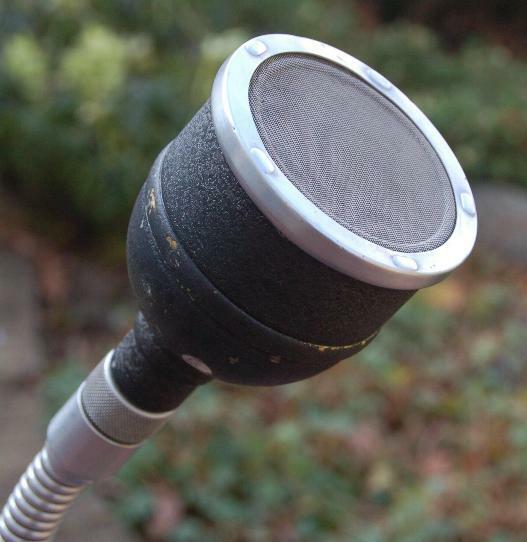 Portable all valve microphone mixer. Still works very well! Lights up and the VU meter needle flicks in response. GA-TV can accurately recreate camera badging and studio ident logos. Important items for which we have an extensive reference library. The example shows 'Associated-Rediffusion' from circa 1958. The SCOOP was a 1k soft light source used originally in film studios. 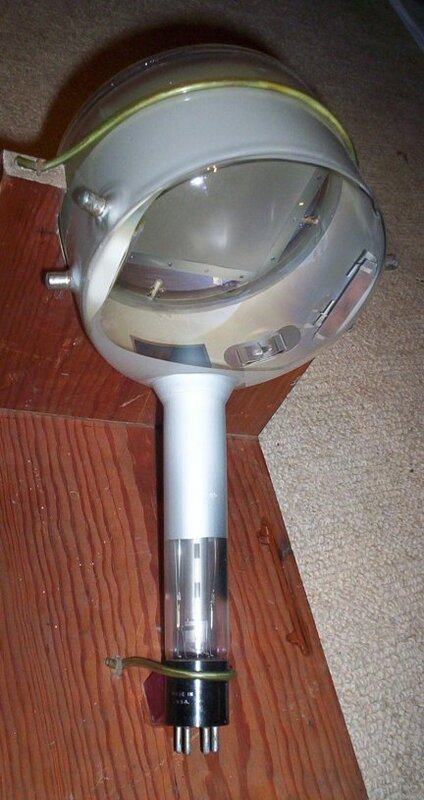 In the 1950s Scoop lights were used extensively worldwide in Image Orthicon monochrome studios. The Vinten Mk 2 pan head used compression springs to moderate the tilt angle. This large pan head was also devised as a 'duo-pan head' with added pan & tilt control wheels similar to a cradle head. 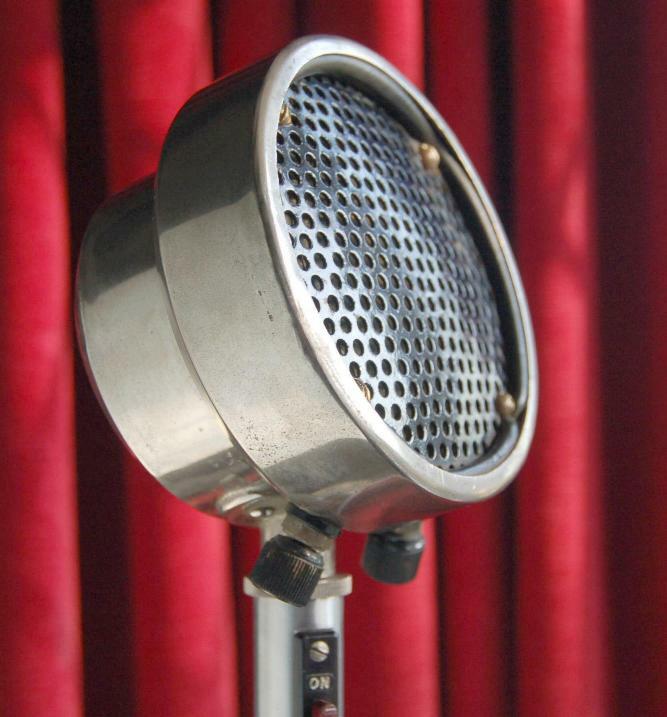 The Vinten Mk 2 pan head was used in 1950s tv studios until the very much better Mk 3 came along. The Vinten 459 pedestal- seen in the picture with an EMI 201 vidicon camera- was designed as a lightweight 'cost effective' item. The pedestal has chain-linked wheels and a spring operated column. Used originally in small presentation studios-news/weather reports etc. The larger picture shows an additional 'steer ring', added by GA-TV. 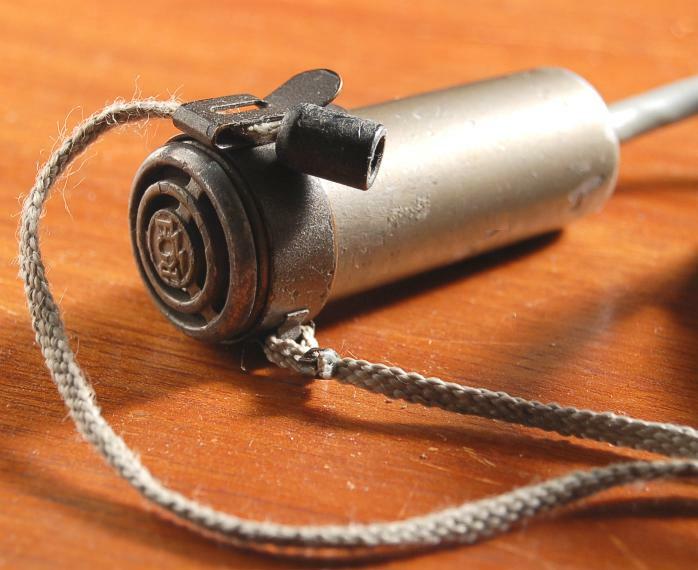 This Russian LH 7 (if we have successfully translated) was an IMAGE ICONOSCOPE type high velocity tv camera pickup tube. This example was used during the 1960s by Hungarian TV. 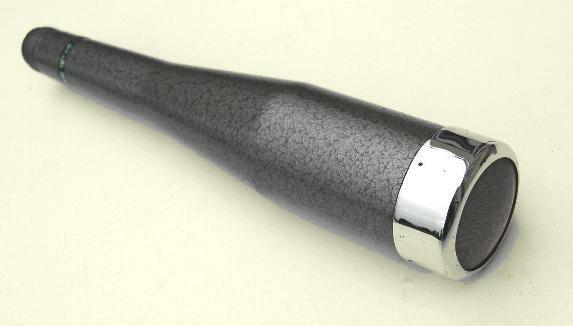 The famous 4.5 inch Image Orthicon monochrome camera tube was devised originally (1947) in the USA by RCA. The prototype was perfected by EEV and Marconi in the UK and the first production models went into service in the mid-1950s. Later versions used the 'ELCON' target glass, making the EEV 4.5 inch I.O. the tube of choice for tv stations throughout the world. EEV I.O. tube manufacture closed in 1982 after sales of over 250,000 units. 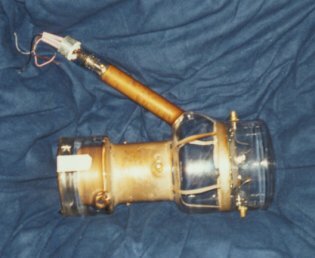 The CPS (Cathode Potential Stabilised) EMITRON 10764 was an Orthicon-type monochrome low velocity imaging tube devised originally by RCA in the mid 1930s. 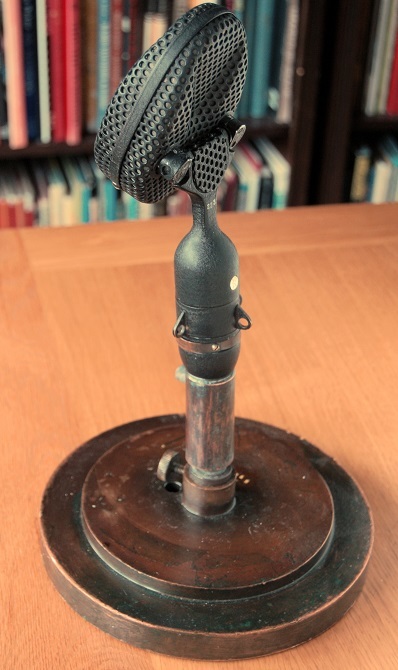 A forerunner of the Image Orthicon, the Orthicon design first saw US tv service in 1941. 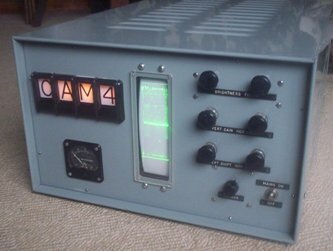 The UK-built EMI CPS 10764 was installed at the BBC's Lime Grove studios in 1956. 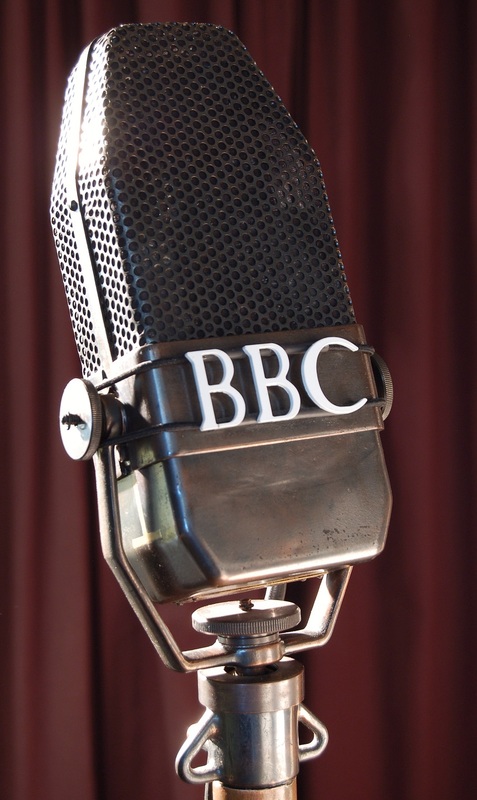 (Earlier CPS Emitron Orthicon types had been used by the BBC since 1948). The CPS 10764 image quality was much admired in the production gallery although on the home receiver the picture always looked 'soft'. All metal pan head and tripod, (extended to 8 ft). 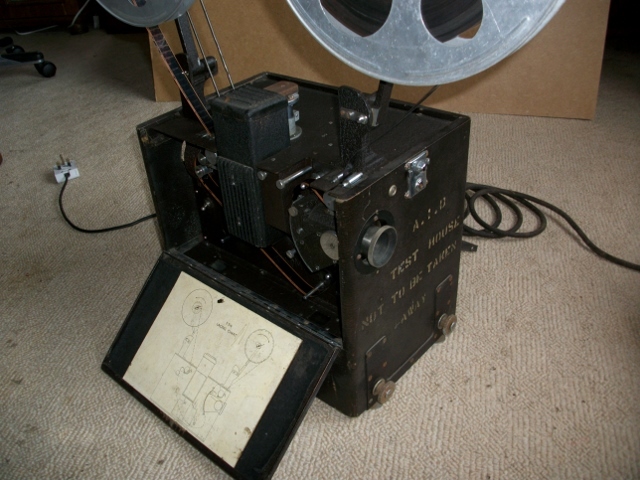 First devised for use with the NS Model G 35mm clockwork movie camera. 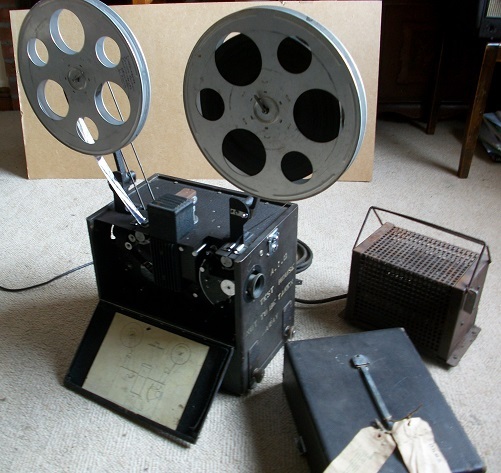 Later use with Auricon 16mm cameras on tv news. Created especially for IBC '97 in Amsterdam this unique camera is an Image Iconoscope camera using a Cathodeon Photicon tube from 1948 powered by modern solid state electronics developed especially for the task. The result is iconsoscope pictures of the pre-war type exhibiting all the 'text book' problems of 'tilt and bend', low sensitivity etc. 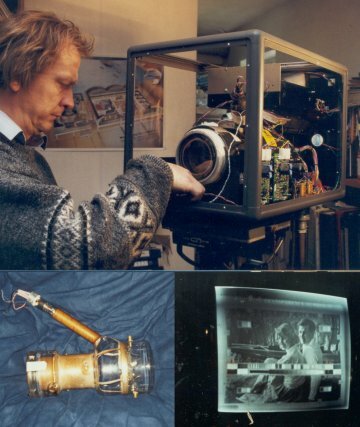 The top picture is of the camera head under construction, the lower left picture is of the Image Iconoscope itself and the lower right picture is an off screen image from the camera. The camera is still operational. Also see 'Pye Photicon'. 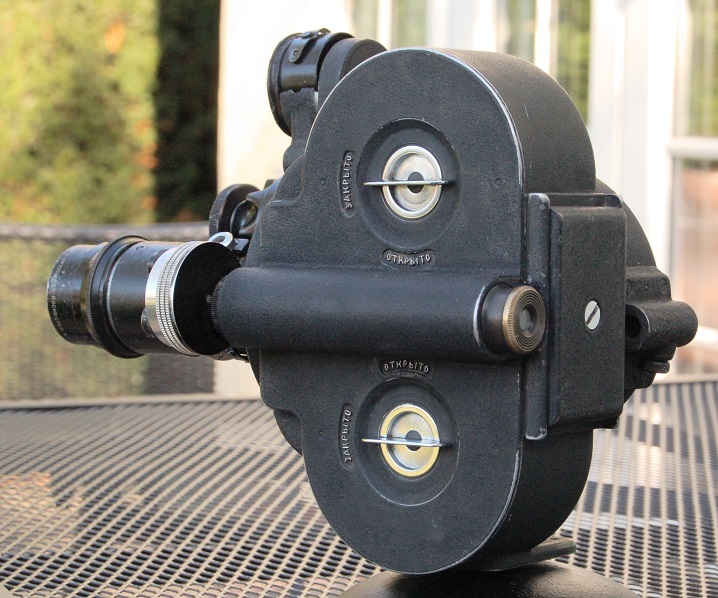 Small friction pan and tilt head, used with Auricon or Arriflex ST cameras during the 1950s & 1960s. 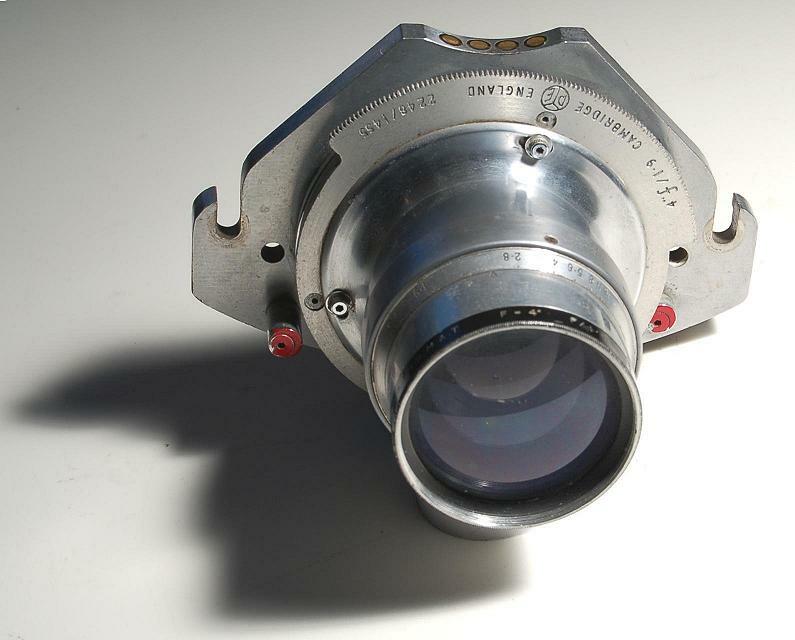 The TTH Varotal Mk 1 zoom lens was designed in the mid-1950s for use with Image Orthicon cameras, (Marconi Mk III, Pye Mk 3 etc.) The Varotal Mk 1 had an optical range of 4" to 20" inches and with an adapter, 8" to 40" inches at f/4.5. The zoom was mounted using a dedicated camera bolt-on front plate or sledge. Controls were by enclosed linked rods fitted to each side of the camera. The example pictured was owned originally in 1955 by Associated-Rediffusion at their Wembley studios. Initially, A-R only had this one zoom, which was shared between the studios and ob dept. 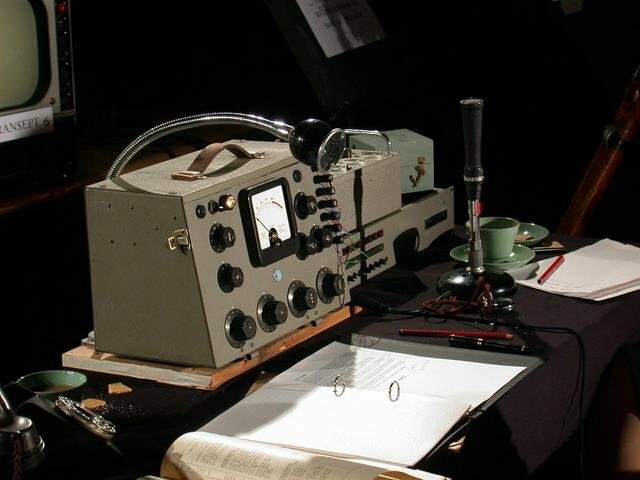 The TTH 'Studio Varotal' 2 appeared in the late 1950s and was designed for use with Image Orthicon cameras. It could also, with an adapter be used on Vidicon cameras. The zoom range was only 2.5" to 8" inches at f/4.5 and as the name suggests, this zoom was for use primarily in studios. The zoom was manipulated mechanically by using Bowden cables (sometimes with jerky backlash) attached to the pan head, or could be powered electrically by using a servo add-on unit. The basic mechanical unit with controls cost approx 800 UKP in 1960. The larger picture shows the lens fitted to a Pye Mk 3 camera. Kodak adapted and provided their range of high-quality Ektar photographic lenses for use in post-war RCA 3"-inch I.O. tv cameras (TK10A etc). These now quite rare lenses, were specially fitted with turret screw mounts, and were fully colour-corrected (for infrared). Dallmeyer made a range of lenses for tv cameras. 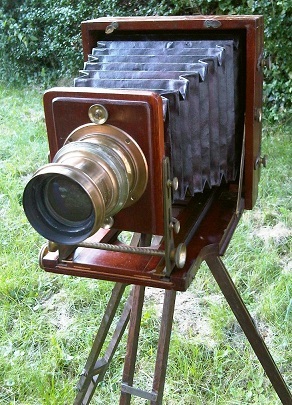 The image shows a 'Super Six' 4"-inch f/1.9. To complicate matters, each brand of tv camera needed a dedicated lens mount. The one pictured is for a Pye Mk 3 camera. Note the four studs on the top of the mount. 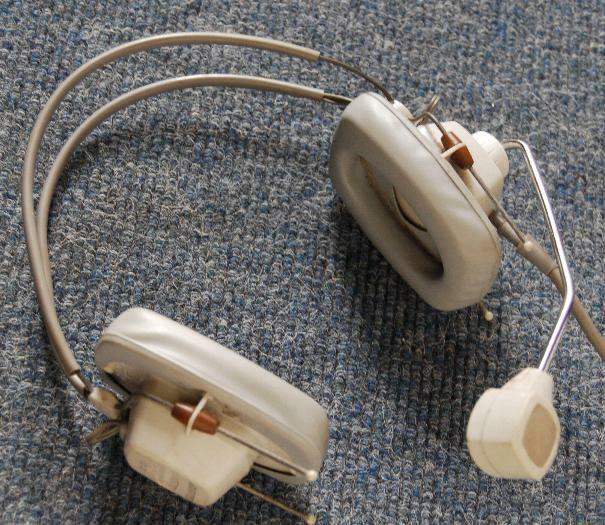 These were used to automatically or remotely adjust the iris when the 'taking' lens was positioned in front of the image tube. The two red marks on each side of the lens are a colour code to indicate, in this instance, 'Camera' One, (BBC Bristol OBs -MCR 12 circa 1955). 1850A Iconoscope camera tube. This tube is from the late 1940's but the design is late 1930's. The difference in the period of manufacture is denoted by the internal white flashing. The tube is not gassed and the getter is still good. 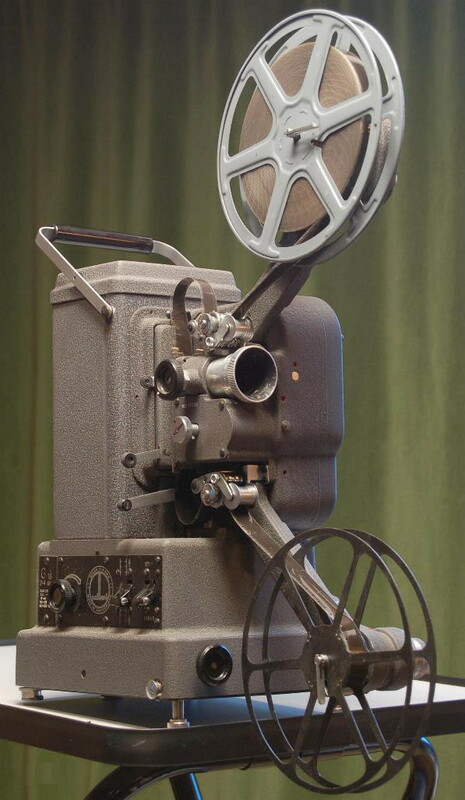 The GB Bell & Howell 613H was a 16mm 'silent' amateur movie projector of good quality with variable speeds. Our example is in almost mint condition and fully operational. 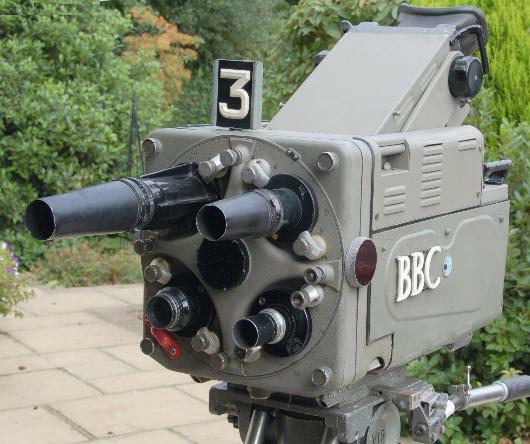 The Bell & Howell EYEMO range of 35mm cameras included a turret version called a 'Spyder'. The version pictured is from the early 1940s and has 1-inch, 2-inch & 3-inch Cooke lenses plus a matching optical viewfinder using a simple but effective system of masks and flip-over optics within the viewfinder tunnel. There is also a critical focus device. The basic camera takes 100ft of spool-loaded film, with an additional 400ft magazine and 12v motor attachment. The camera type was used extensively in WW2 for war footage and for newsreel work around the globe. Working condition. The 3 inch Image Orthicon tube was produced first in the USA by RCA initially for WW2 military use and then in 1945 for broadcast use. Termed a 'low velocity' photo emmisive tube, the 3 inch IO revolutionised tv camera design and tv production because of its high sensitivity. This enabled outside broadcasting to be undertaken in very poor light and also implimented the use of camera lens turrets and electronic viewfinders. One 'trick' of the 3 inch IO was that it could photograph the human face by the light of a single small candle. The black 'halo' reproduced around the candle flame was another matter. This 'Vision On-Sound On' studio sign is a hand-built prop in a wall-mountable black wooden box (approx 90x60cms) with red light bulb illumination. Both 'Vision' and 'Sound' can be switched or flashed independently. Design of the unit is based on the 1936 BBC studio model and that of the BBC Riverside Studios 1950s/60s. Image Iconoscope class of imaging tube. This type was made by Cathodeon (a Pye company). 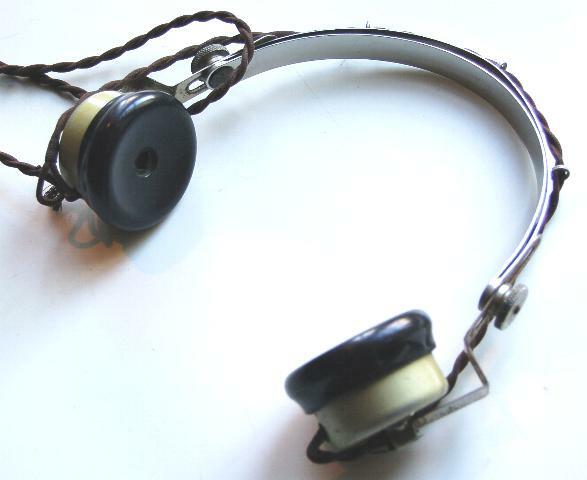 Similar types were made by Marconi-EMI, Philips, RCA etc. pre-war. The idea is to separate the imaging function from that of the storage function. The image section is where the light from the scene is converted into an electron image. This is then transferred to the storage target for reading by the electron gun. Later versions used a number of small lamps around the periphery to help control the 'tilt and bend' problems associated with iconoscope cameras. Nice wooden item from Anglia Television, a studio- contructed (home made) VT clock with red 'on' light and hand grip. This durable item can be seen at the start of many Anglia 405-line tapes. 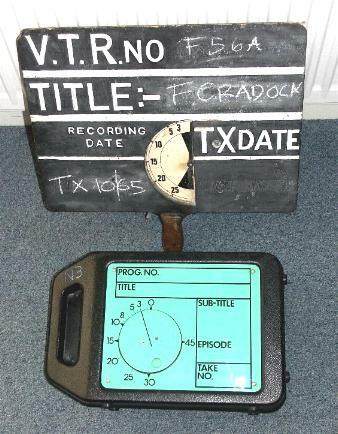 This VT clock is now useful for studio re-creations of the 50's and also the occasional pop promo. 2000 watt type 210 'Junior Solar Spot' from Mole Richardson. 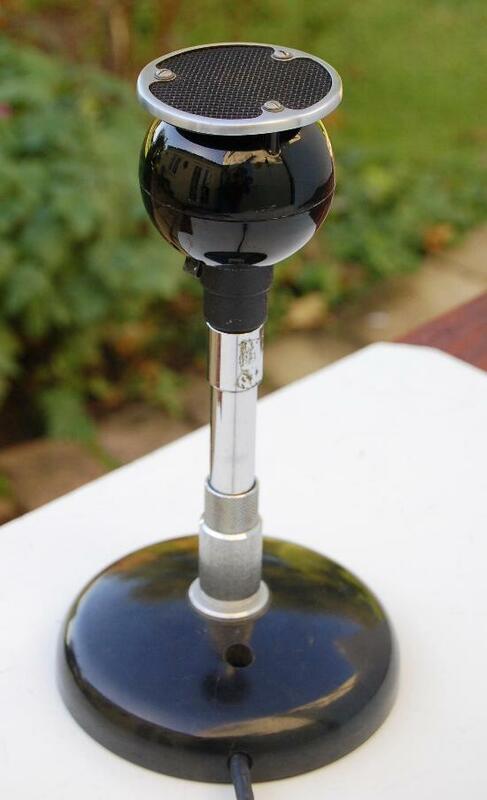 Produced first in 1934, this iconic lamp is now quite rare and sort after. 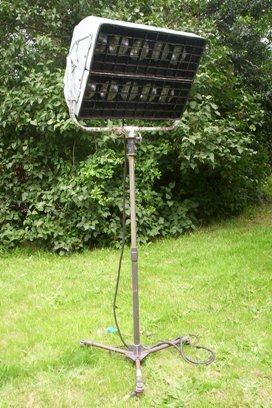 Of cast alloy aluminium, this heavy lamp was of 'silent' operation, specifically 'for use in the production of sound motion pictures'. In our example, the bi-post lamp unit has been implanted with a household light bulb for 'show' only. 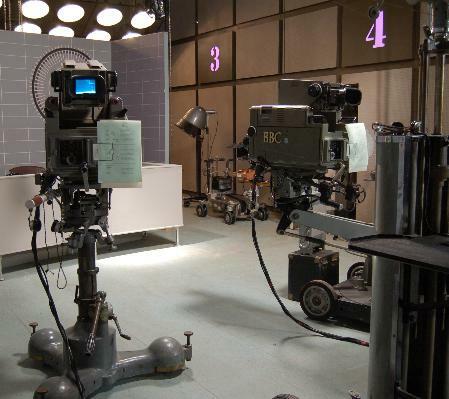 Picture shows two EMI 203 4.5 image orthicon cameras on Debrie pedestals. Jason Isaacs is seen playing 'Harold Steptoe'in the famous junk yard set for a BBC4 drama series entitled 'The Curse Of Comedy'. GATV supplied also several vintage cameras and related equipment for two other plays in the series, 'Hancock & Joan' and 'Most Sincerely', about Hughie Green. 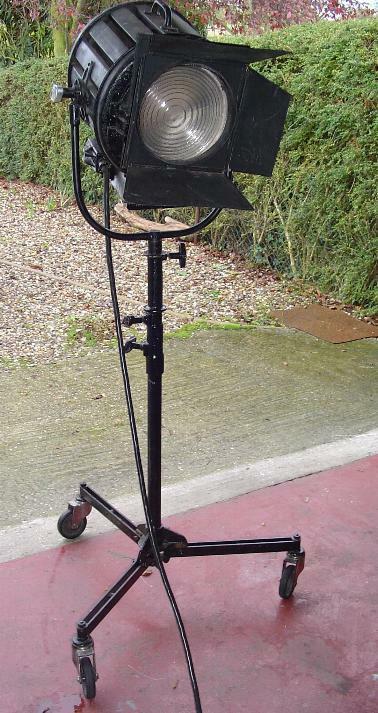 Unique in the UK, a complete RCA friction pan & tilt head with tripod (type TD 11A) and dolly (type TD 15A). This friction head type was used extensively in American monochrome tv stations and also on 'remotes' with the tripod and dolly combination which folded for easy transportation. 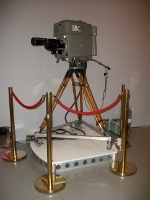 'Low cost' tv studios also used the tripod and dolly as an alternative to a pedestal. Manufactured by Houston-Fearless, the RCA pan head & dolly was used for over twenty five years (and may indeed still be running around somewhere). Larger picture shows the Dolly/Skid folded. 10 lamp, 2KW flood bank. As used in many British TV studios, especially in the 1960s. Fibreglass body. Fully practical and a useful lamp. Handheld (or bracket mounted)cine lights. The two pictured are 650 watts and mains powered only. Very bright & very hot. Used on tv news or documentary work. Also amateur movie-making. GEC spotlight of probably 1950s vintage. Non-practical but does have a 100w bulb implanted for 'effect'. Used originally for am-drams, in church halls or on cheap British films. A late model in a series of sets commonly known as 'GEC bow front.' Very popular in the UK in the early 1960s. Now operational and on optional legs. 405 line set made in 1948 and in full working order. Can be supplied with a miniature 625-405 line digital converter. The set's design, being a 'mirror lid', is of pre-war origin and could be regarded as typical of its type back to the mid 1930s. Solidly built work horse. Operational, with optical sound. Operational unit in excellent condition. 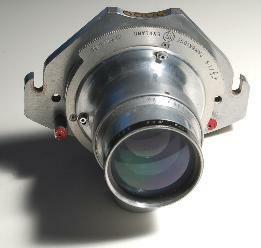 An example of a Dallmeyer DALMAC lens: 5"-inch f/3.5. This lens is dated 1951 and it fitted onto the turrent of a Marconi Mk II image orthicon monochrome tv camera. The 'sleeve' around the front of the barrel was a toothed ring, linked to an 'auto iris' servo motor. 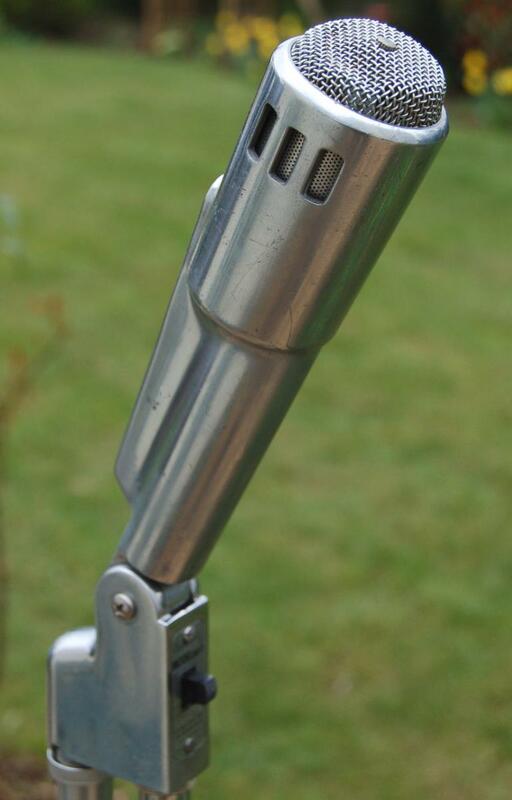 The rear attachment was a bayonet system. A selection of vintage Mole lighting 2K Spots and Ten Lights strung above a set. Useful-sized studio floor foldback speaker. Manufactured in Glendale California, this pan head is numbered 91. 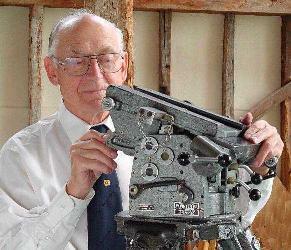 Much copied, the Mitchell movie camera pan and tilt head has no equal and our example is in full working condition. Tension springs help moderate the 'tilt'. 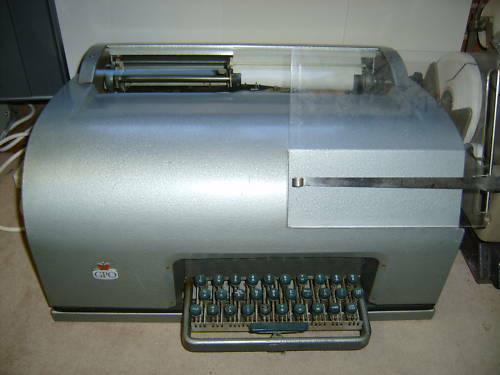 Classic teleprinter of a type made between the early 1930s and the late 1950s. The picture shows the machine with its 'sound-proof' cover fitted, but this was an optional extra, and many were used without - especially in the 1930s and during World War II. Fully operational and can be used with an interface unit (supplied) to print out text from a standard PC. The Auricon Pro 600 was one of a line of 16mm sound-on-film movie cameras produced by the Bach Auricon Inc company of California. The Auricon was a lightweight 'single system' camera whereby the sound was recorded within the camera itself, initially as a optical track and lattery, magnetic. 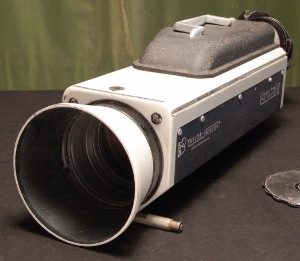 The Auricon camera became popular for television newsfilming, notably used during the Vietman War. Compact and handy illuminated 16mm film viewer. The kit comes with rewind arms, splicer and a film horse. The larger image shows the viewer 'dressed' on a recent production, set in the 1950s. Other items of film editing equipment available. Small but quite heavy 9.5mm cine camera from the 1940s. Uses a pre-loaded cassette. Fixed focus lens but with a limited aperture range. DALLMEYER TELEOG 25" inch f/5.8-32 ‘folded’ telephoto lens. 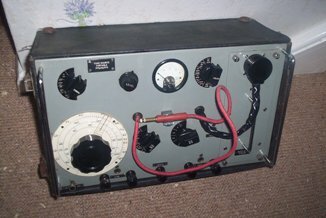 Marconi MkIII fitting (type TV 88). 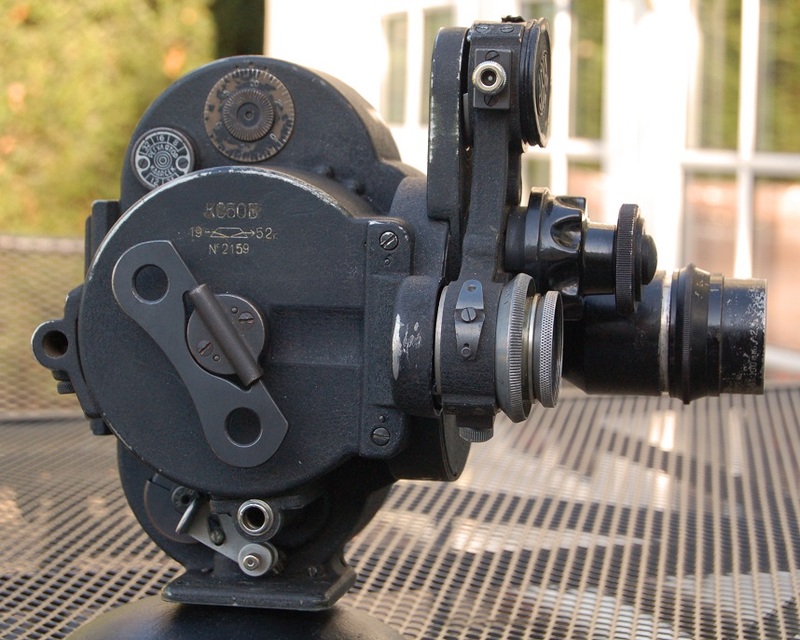 The lens barrel unit was made by Cox, Hargreaves & Thomson Ltd. The lens itself is ex-BBC MCR 9 (Wales) These large lenses overcame length by using a periscopic method to 'fold' the light path with an internal angled mirror. The lens usually travelled in a heated box as condensation could play havoc with the picture quality if care was not taken, especially perched atop a gantry in a force ten rain storm with no easy access to maintenance. Small Hewitt spot light. 100 or 200watt. Typical Hewitt shape. Non practical. A fully operational example of the classic semi-professional tape recorder found in numerous applications from schools and colleges to film and TV production. 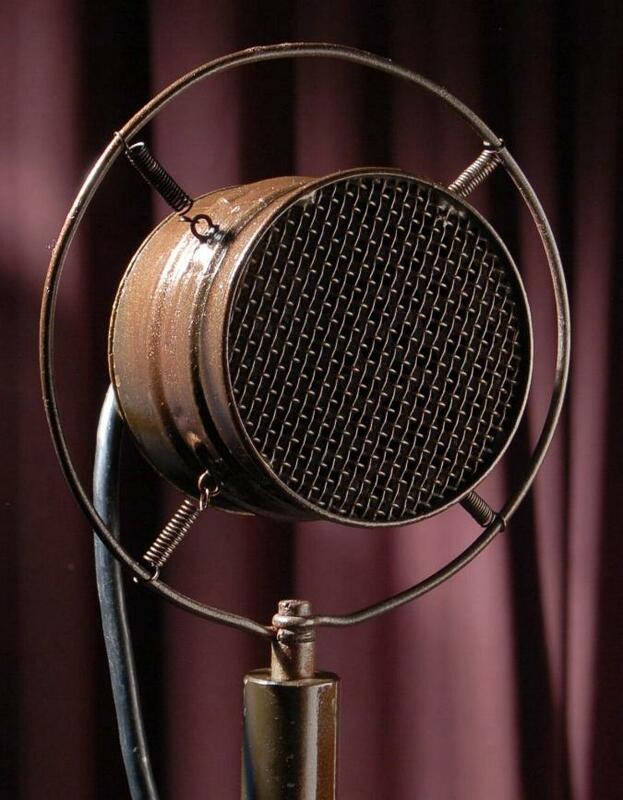 Shown with detachable lid and the Reslo RBT microphone so often associated with this machine. Studio scene from the shooting of Series 2 of the BBC's 'The Hour'. 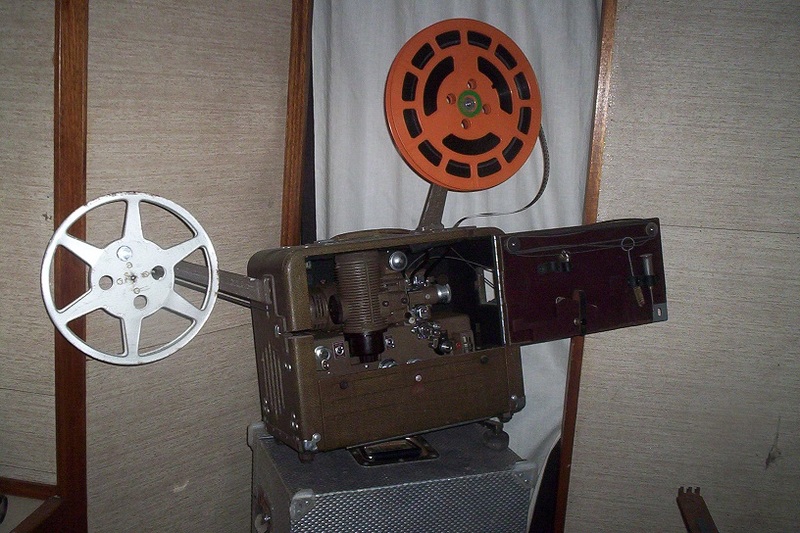 The Moviola UC 210 S is a 35mm film editor with a reproducer for magnetic or optical sound. This model, the type was devised first in 1954, has no dedicated spindles and is used for editing short lengths. 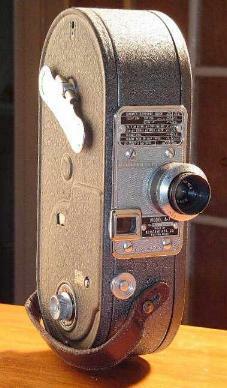 This is a late model RX version of the reflex focussing Bolex H16 16mm camera. This camera, dating from 1959, had a variable shutter and an added locking mechanism for the turret. OVERALL DIMENSIONS: 8 1/2" x 6" x 3" WEIGHT: Approximately 5 1/2 lbs OUTER CASE: Highly polished duraluminium body, covered in genuine Morocco leather. Metal parts are chrome-plated. FILM CAPACITY: 100ft (30m) and 50ft (15m) daylight loading spools of 16mm film. THREADING: Automatic threading and loop forming. The end of the film is simply placed in a channel leading to the feed sprocket. The release is pressed and the film is then automatically threaded throughout the entire mechanism. MOTOR: Constant speed, spring motor mechanism; governor controlled. Large winding handle folds downward and attaches to camera when not in use. Spring cannot be over-wound. 8:1 external drive shaft permits the attachment of an electric motor. TURRET: Rotating turret with folding lever; Accommodates three interchangeable C mount lenses. VIEWFINDER: 6x magnification; Reflex viewing with semi-reflecting prism system; Groundglass focusing; Adjustable to eyesight. FILTER SLOT: Built-in slot holds a gelatin filter behind the taking lens and in front of the shutter. VARIABLE SPEED: 12, 16, 18, 24, 32 and 64 frames per second. This item is in working condition. Light Vinten version of their gyroscopic pan and tilt head range. 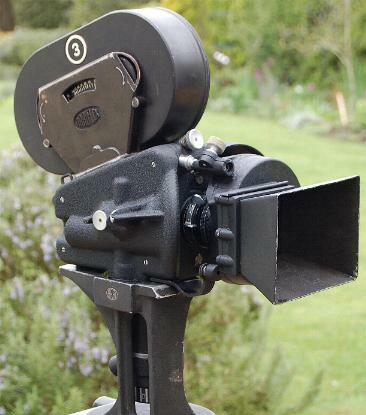 This pan head was suitable for use with smaller 35mm cameras such as the Newman Sinclair, Eyemo or Arriflex 35mm. The gyroscope system- for both pan and tilt-was useful for smoothing out camera actions when using long lenses. Our example has been fully restored. Several GPO/BT (and others) telephone handsets from the 1950s/1970s. Large 16" inch 'cradle' pan and tilt head from Moy of London. Used by film studios worldwide. Also special effects work and stop motion animation. Our example ex-BBC Television. Company History: Established by Ernest Francis Moy (c1869-1926) and Percie Henry Bastie in 1895 to manufacture fuses, circuit breakers and switches; from 1897 began establishing cine equipment patents, even producing films through the off-shoot company Cinematograph Co. Produced first cine camera with daylight loading in 1900, the Moy and Bastie camera; by 1911 Moy cameras in use by film makers worldwide. Classic French movie camera, designed in 1947. 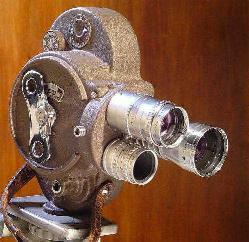 This camera was adopted by the French 'New Wave' cinema because of its portability and flexibility. The camera could shoot either 35mm or 16mm film and had a three-lens offset turret. The focussing was through a mirror reflex viewfinder. 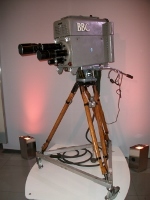 The camera used also by newsreels, advertising and tv. The Rank series 'Look At Life' features the camera in it's opening titles. Neat and stylish Western Electric 'Bell System' cameraman's headset rig. 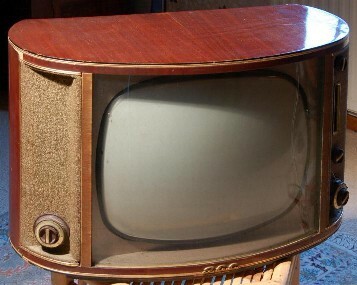 Used throughout USA television from the late 1940s. Our example, from ABC-TV, Hollywood. An ARRIFLEX 16mm sound blimp. Circa 1956. 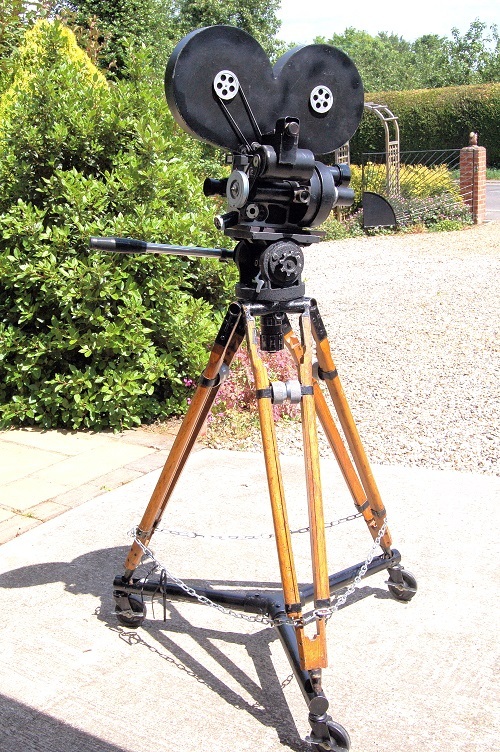 Carries inside a well-muffled Arriflex ST 16mm camera with a 400-ft magazine. The inside camera is not necessary for 'film studio' recreations. The outside is imposing enough. Robust German pan and tilt head plus wooden extending tripod from Max Killi (KM) of Munchen. 1950s. Standard wedge fitting. Rather bouncy and unrefined spring tilt mechanism. 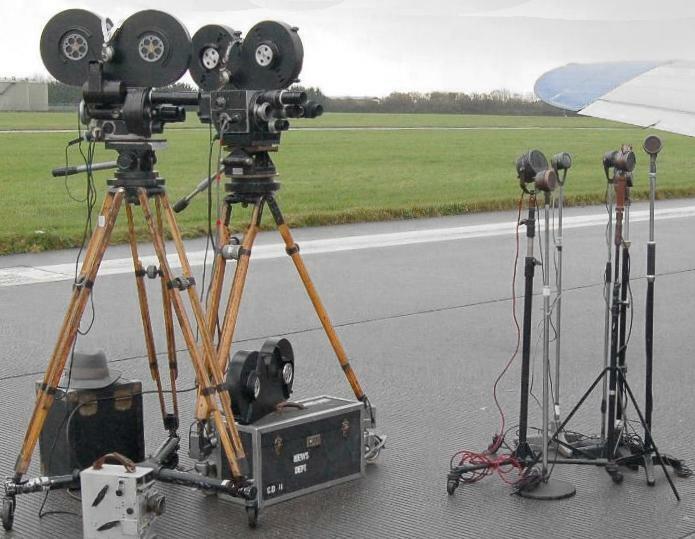 This equipment was used mainly by European tv and film studios. Not seen in the UK. Small portable battery powered sound amp used in conjunction with the Auricon range of sound-on-film 16mm cameras. Other uses and headsets variable. Carry-cases black or brown. A bespoke wooden CAPTION STAND, designed for use on the studio floor. Our example was employed orginally in Studio Two at Teddington Studios, ex-ABCtv/Thames. 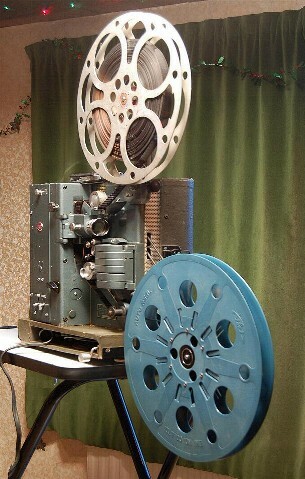 A classic 1940s projector design that was used by all three British armed services during World War II and post war. This particular example belonged to the Air Ministry. In excellent working order, running off a modern 110V transformer. Very quiet operation. Matching period screens available. Click on the picture for a closer view. 'Screen in a box' - the screen pulls up and locks into place. About 4' diagonal. 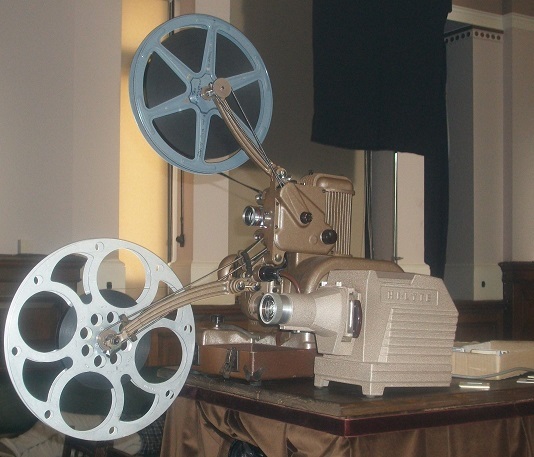 Well-known 16mm sound projector used by armed services, schools, colleges, industry and well-heeled amateurs. Good operational working order. Supplied with spare lamps and instructions plus a matching large speaker cabinet if required. Unusual looking design as used in schools, colleges and industry. 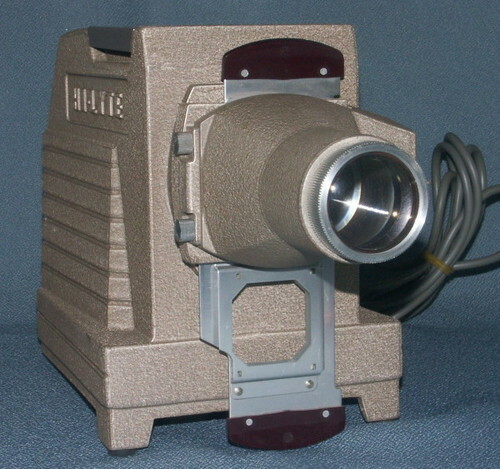 A fully operational example of this rugged projector. 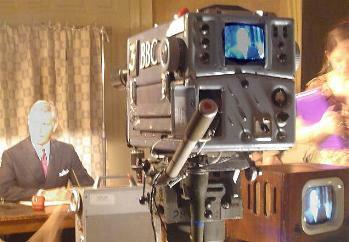 Click on the picture for another view of this projector on set of the BBC's 'Call the Midwife' in 2013. 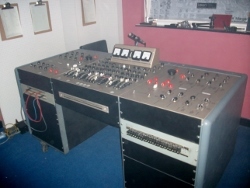 A copy of the famous REDD 37 mixer as used by the likes of the Beatles at Abbey Road. Of the two remaining 'real' units, one is still at Abbey Road and the other is in the USA. This is the only known (non-functioning) reproduction in the world. The REDD 37 is a four-track stereo machine and was developed from the earlier two-track stereo REDD 17. All the controls function mechanically and the meters are wired to 'twitch' as required. The graphics are authentic and unit weighs considerably less than the real thing! Marconi Mk II Image Orthicon camera on Film and Equipments pan-tilt head as seen at the opening of New Broadcasting House in June 2013 in London. Click on the image for a closer view. Large, very long and very heavy zoom lens mainly for OB use on any of the turret Image Orthicon cameras of the late 1950s and 1960s, such as those by Pye, Marconi, EMI and others. 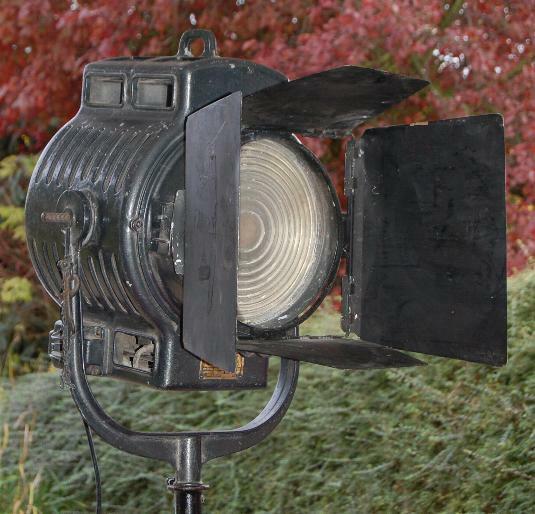 Classic French Debrie pan and tilt head, developed for the film industry but used in the 1950s by European and British tv companies. Balanced via three springs to dampen the tilt. A very early zoom lens designed initially for film camera work but adapted for television applications in the early 1950s. Such lenses played a vital role in the television coverage of the Coronation of 1953. 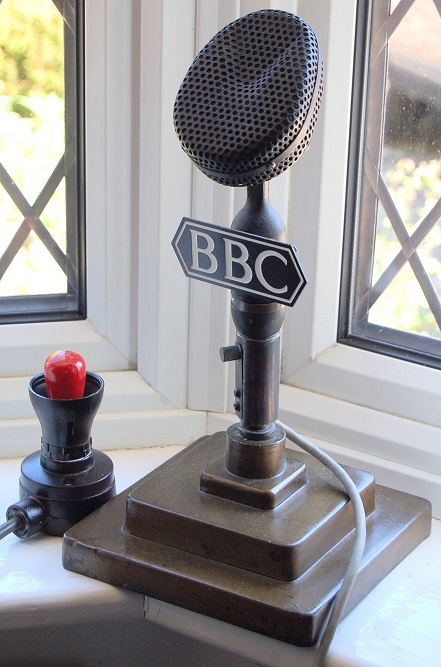 Our example is in Marconi house colour of the period and can be used with a custom-made adaptor tray with a Marconi MkII 3" Image Orthicon camera. The KODAK CINE SPECIAL is a cassette-load sophisticated clockwork 16mm cine camera with a two lens offset turret. This camera, originating in the 1930s, was popular with wild life photographers. The early editions of David Attenborough's wild life tv series was filmed using a Kodak Special. The camera had five filming speeds, a variable shutter and a single frame facility. Backwind for other effects. Japanese twin lens reflex 120 roll film camera. 12 exposures per roll. Quality product. Late 1950s design. Shutter speeds up to 500th sec. Yashinon 80mm lens. f/3.5 to f/22. Cheap 127 roll film camera from Kodak. Vintage 1948 Bolex H16 16mm camera. Non reflex. Critical focus finder on the top. Camera takes double sprocket film. Motor works. A type 21 Mole Single Broad soft light. 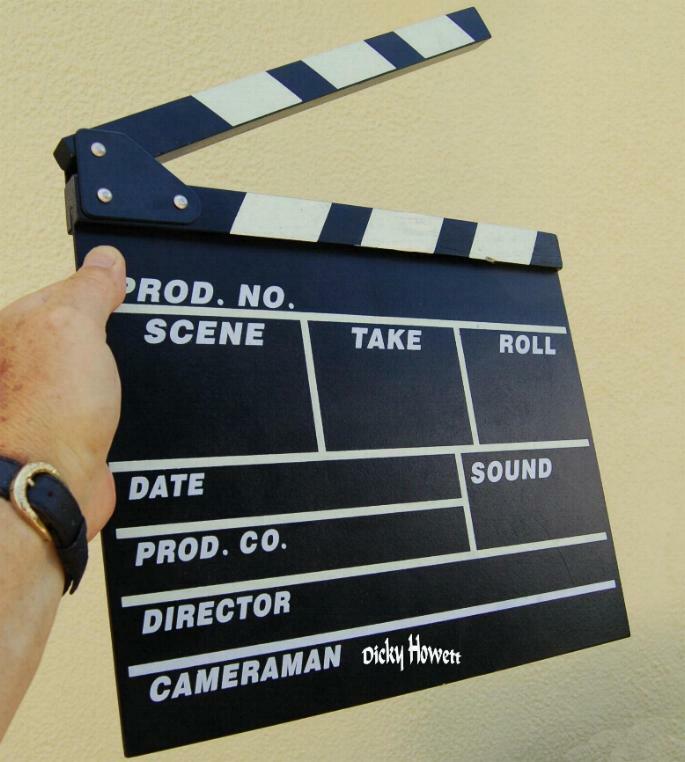 Used in film and tv, mainly on small interview sets or in presentation studios. Our example was used lattery at BBC TV Centre in the engineering dept. Double 8mm very basic cine camera. Flip up viewfinder. Lots sold all over the place. 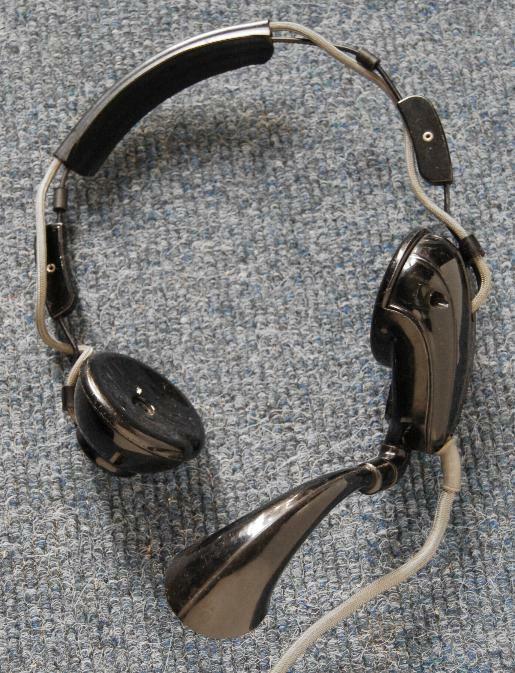 Large chunky headset, used previously by a location sound recordist. Possible military use. Seen some action. The original KODAK SPECIAL model was designed in 1933. This clockwork, 100ft cassette-loading 16mm camera was sophisticated for its time. Five filming speeds, a variable shutter and critical focusing, back wind and single frame. These cameras had two in-line lenses on the twist turret. Viewfinding was by flip-up optics on the lens unit. These cameras were favourites for wild life and industrial photography. Our example has two focussing Kodak Anastigmat lenses- 15mm and 25mm. The RCA TK11A was a 3"inch b/w image orthicon camera used mainly in the USA and Asia. Some European use. 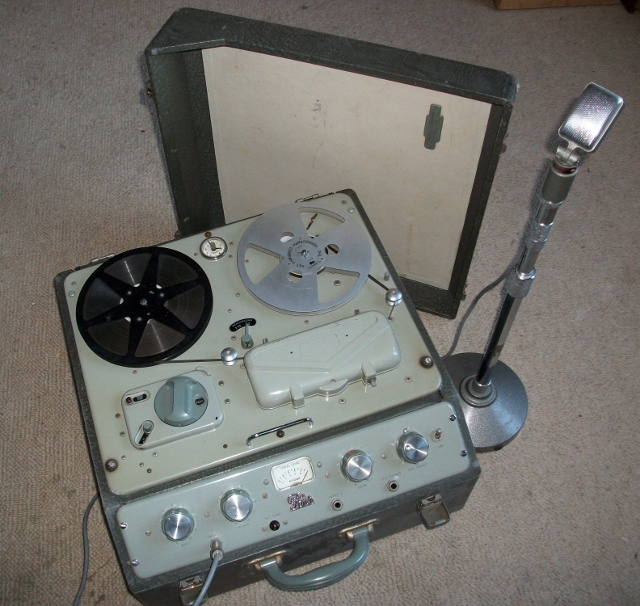 A few were used in the UK during the 1950s by the independent television company Associated-Rediffusion at their Wembley and Kingsway studios. The camera generally used Kodak Ektar lenses. This camera is non functioning but implants possible. We believe that this is the only example of this camera type in Europe. An early 1930s/1940s example of a Bell & Howell 'Filmo' 16mm 'silent' amateur projector. USA design. An Arriflex II 35mm camera from 1948. This model has a customised matte box/ray shield plus a side-mounted Arri motor. 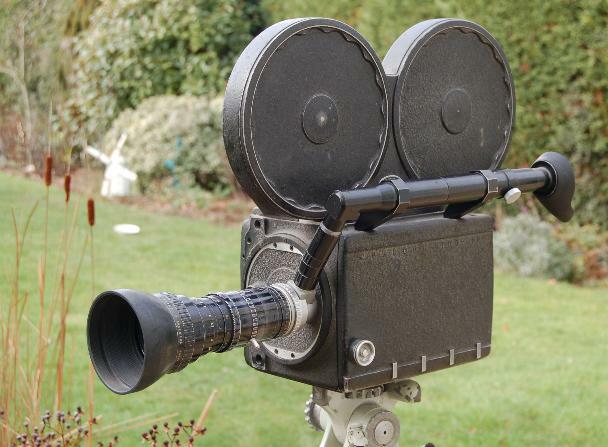 This camera was used for low budget UK theatrical features. The portable STEENBECK ST4 roller caption device can be used also (as pictured) as an 'autocue' device. 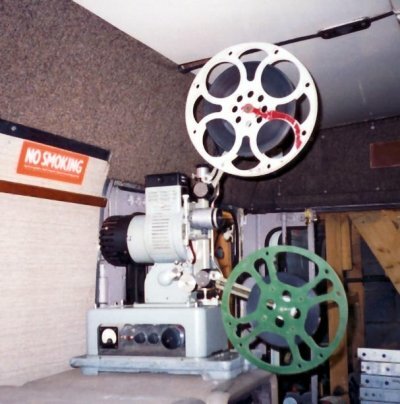 A Mole Richardson Roller Caption machine, used before digitally generated characters, to display the 'credits' at doubtless, a comfortable reading speed. An original and rare (most standard Mitchells were converted to animation or used as the mechanism for re-engineered Panavision cameras) this 35mm STANDARD MITCHELL (no. 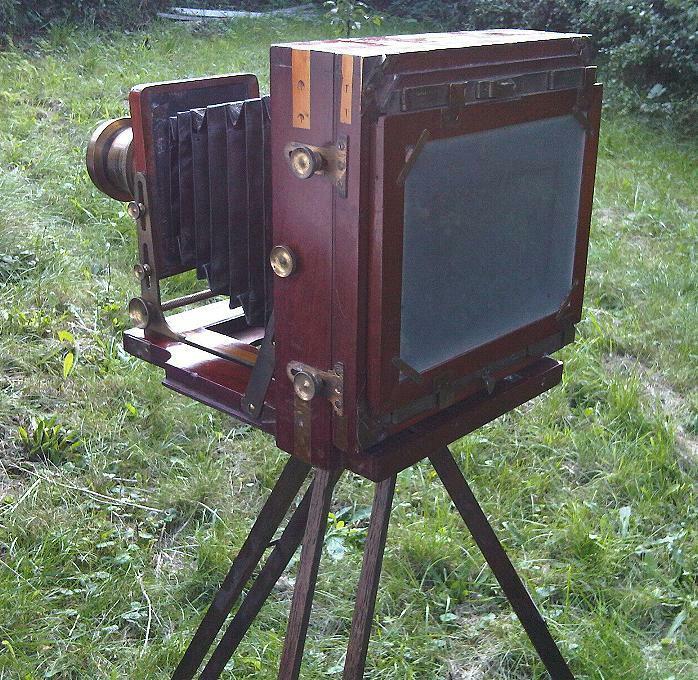 146)was purchased originally by RCA Photophone at the end of 1928. This camera was used at Hollywood's RKO studios during the 'Golden Era' of the 1930s and 1940s. 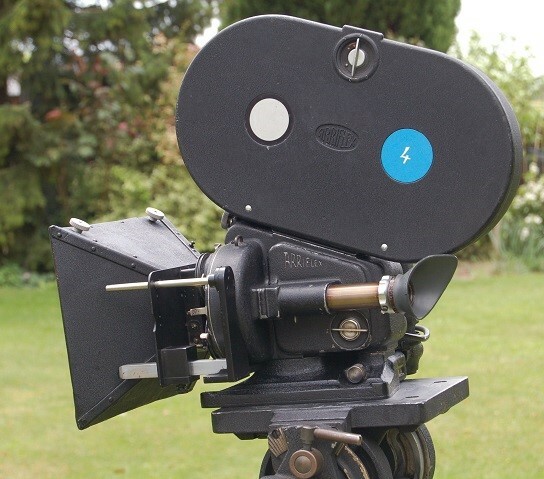 The camera can be hand-cranked to recreate 'silent movies' and fitted also with a 'Peanut' 24V DC motor and a 1000ft magazine for 'sound' shooting. Turret set of original Baltar lenses. Hire of this unique camera possible, but under very strict conditions. 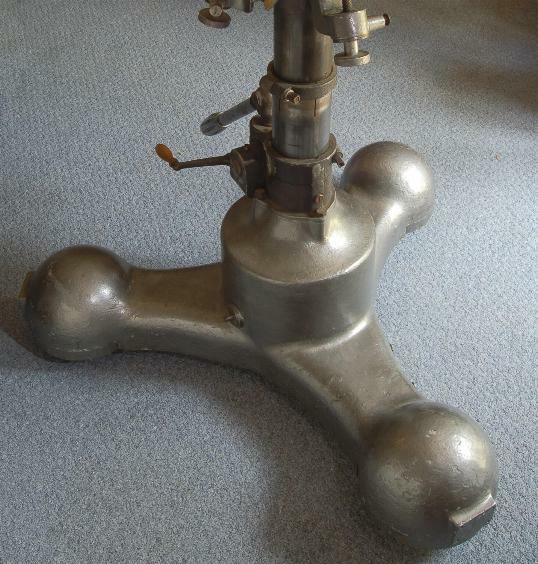 Eccentric design friction pan head and tripod from the French company Éclair. The unit is marked 'Brevis Coutant Mathot' and dates probably from the mid 1950s. The head accepts a standard wedge plate. The full rig is quite heavy. Lightweight Vidicon studio camera from EMI. Used mainly in news and regional studios. Repro turret. The pedestal is a Vinten 459. Easy to ship. All suitable for stage productions. A full-sized Bell & Howell 35mm movie camera of the 1930s/1950s with a 1000ft magazine. In fact, the entire camera, based on the ubiquitous Bell & Howell 2709 model is an exact and skillful reproduction, made of wood. This (very lightweight)camera can take HD imaging without detection. Non-functioning. A Bell and Howell (Chicago) Filmo 70A (produced first in 1923). A 16mm camera with one Taylor-Cooke f/3.5-f/16 fixed focus lens. Running speed 8-16fps. Clockwork drive. 100ft daylight loading spools. Our example has had bodywork restoration. Working condition. 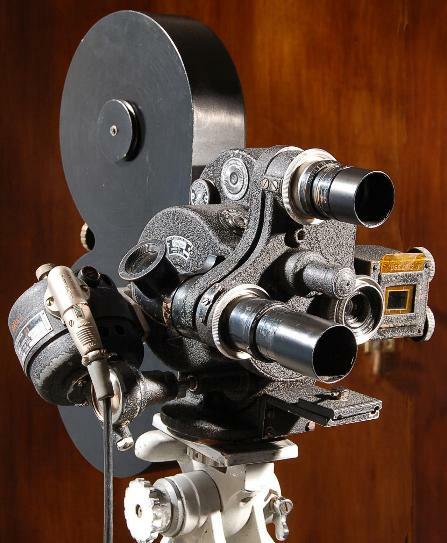 Bell and Howell were the first to produce a 16mm spring-wound movie camera. The initial retail price was $180. A rich mans toy. 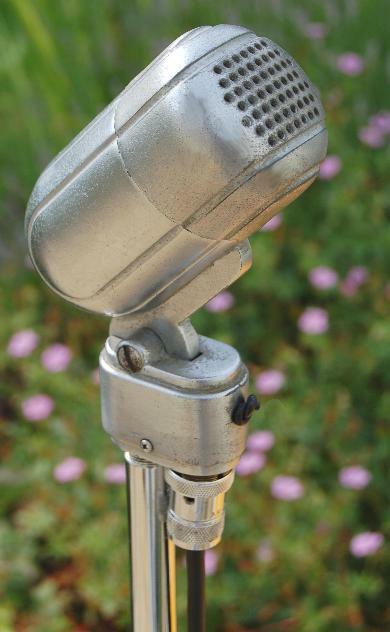 This classic Vinten pedestal, appeared first in the mid 1950s. A balance of oil and nitrogen, the pedestal enabled the camera operator to track and jib without losing sight of the viewfinder. Heavy but smooth action. Later versions had the wheels linked to the steering ring. 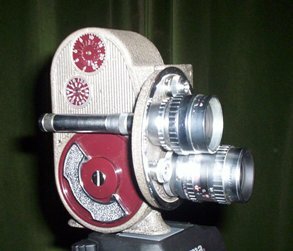 An adapted Vinten K 35mm movie camera. 1940s era. Newsreel or documentary use.